I remember back in my 20s. I thought I had a budget. Well, it was what I called a budget. The reality is that it was a slip of paper with some numbers written down on it. I honestly did not know how to budget, let alone how to stick to one. 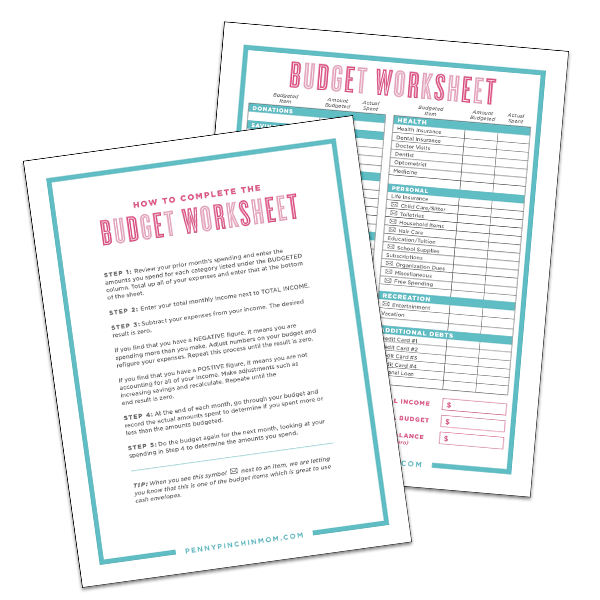 It wasn’t until my husband and realized that we had to make a change that I figured out how to create a workable budget. Not just a workable budget – but finding the trick to sticking to a budget. You may be like me. You know who you should pay each month. There is a list somewhere that shows all the places you must pay (and honestly, is probably not every person). There are numbers listed, but they are more of a guesstimate than an actual budget. The truth is, you don’t know how to budget. Don’t be ashamed because you aren’t alone. Thousands of people, just like you, don’t know how to create a budget. Even more, have a budget, but they don’t stick to it. In fact, for many people, the budget they have right now doesn’t work for them. They just don’t know how to write and make sure they are always sticking to a budget. Prepare it together (if in a relationship). Now, before you get too far into this post, I want to make sure you’ve got the tools you’ll need to make your budget. Make sure you sign up here to gain access to our resources library, where you will locate the forms you will need to create your budget and financial plan. Are you ready? Great! Let’s dig into these ways to make a budget work. It may sound simple, but honestly, it is one of the main reasons that budgets fail. You don’t account for every cent you make, so you aren’t sure what to do with it. Do you save it or spend it? Do you use it towards debt? If you don’t tell it what you want it to do, then it will just find a place to land for you – and often, that will not be what you want. Instead, review your budget and account for every penny you make. Give every single penny a job to do. Tell it where you want it to go — and never give it an opportunity to try to be in control. If you wait until you start to pay your bills each month, your money has already taken over. It’s too late. That is why it is essential that you sit down every month and review your budget. The cost of groceries may have gone up. You might have found a way to reduce your utilities. Make all the adjustments to your budget before payday comes. That way, when the money comes in, you jump right in and put it to work for you. There will not be any surprises popping up. The truth is that most people are in debt because they are spending money that they do not have. They usually do this through credit cards. I’m not saying you can’t use credit cards. Not even close. You just must use them the right way. That means never charging any more than the cash you have on hand at that time. There is no guarantee that payday will arrive. Can you pay your credit card bill if your paycheck doesn’t come? What would you do if your employer suddenly closed shop and you had to wait for bankruptcy proceedings to get that final check? You’d be in a world of hurt because you could not pay off your card at that time. The right way to use a credit card is to have the funds needed to pay it off available in your checking or savings account. If you have $800 set back, that means you can’t charge $900 during the month. Watch your charges to that you know you can always pay the balance in full every single month — without having to rely upon a paycheck to do so. Let’s face it; life is good great throwing us curve balls. Medical or family emergencies, job loss, housing issues — any of these can pop up without warning. That means you must be ready. When that happens, you don’t want to have to throw the budget out the window because you can’t cover the expense. You absolutely must have an emergency fund ready to cover those costs. Even if you don’t make much, you can still build an emergency fund. You just should look at it a bit differently and put systems in place to make it happen. Remember, even $5 a paycheck saved is better than $0 saved. If you are in a relationship, it is critical you work on your budget together. It doesn’t matter if you split up the bills and each takes responsibility for specific items. You both still must see where every penny is spent and together determine how you will spend your money. Creating a budget that works for both of you encourages open communication and honesty. You both make money, so you both have a say in what to do with it. It doesn’t matter who makes more here. What matters is the way you handle your money together. Failure to have a workable budget is a frequent reason for money fights between couples. One spent money that was needed for rent or decided to go on a shopping spree. Sitting down and discussing your finances together, as a couple, is one of the most critical parts of your relationship. You are grown-ups and need to be responsible for your money together – as a team. You’ve worked hard to make a budget. Now, you need to know the tricks for sticking to it!After all, what is the point of having a budget if you won’t make sure it works? Here are some of the tricks we use to ensure we stick to our budget month after month. We always track our spending. We know we won’t overspend on fuel or the mortgage. That just doesn’t happen. However, when it comes to groceries, dining out and food, we track every penny. Doing so allows us to see how much we have spent and what is left to spend until the next payday. It is important that the amount of income on your budget is accurate. You can’t guess here. Make sure you consider every penny coming into your home so that you can put it to work (see above). Some expenses are paid once a year. These might include insurance or property taxes. The issue comes up when these were not built into your budget. You should save a bit each month to cover any of your bills that are paid in a frequency other than monthly. That way, when the bill comes due, you aren’t struggling with finding a way to pay for them. This is another trick to sticking to a budget. You don’t know when the air conditioner will break down. But, what you can do is to plan for it. The way you do this is by creating an emergency fund. Always set money back every month so that you can cover those unexpected expenses that may pop up from time to time. As much as you would love to spend only $300 a month on groceries, that is probably not a reality. That means you can’t put the number you want to see on your budget. You must use the numbers that really work. Be honest and prepare a budget using amounts you currently spend. If your budget will not balance because of overspending, you can figure out where you need to cut back. But, at least you’ve got real numbers that accurately reflect how you spend. With a few simple changes in how you create a budget, you’ll figure out the way to make it work. Sticking to a budget is the key to having a strong financial plan.